Bout time you posted this thing up. If you like the yellow, then go with the yellow. The gsxr yellow schemes are good looking, better than any other brand i think. Is that a horn on the subframe? Personally, I love the color scheme. What all do you have to replace? that was my fav gsxr color scheem. 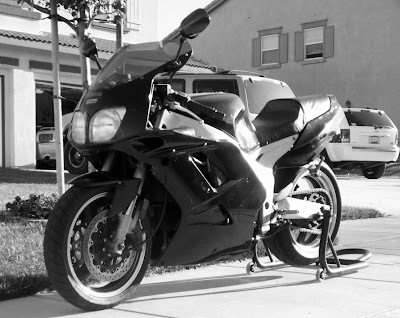 i say keep it, or put 01 gsxr1000 plastics on it, the black and sliver would look pimp....just dont race any 1000's then haha. nice fizz! she looks great! "(12:38:42) sweekster: i work when i want because i'm sweeks"
years back i personally love the Gunmetal grey think it made a bike look unique .. 2009 if i ever come across some plastic for my bike im going ALPINE WHITE baby ..
orange and black but do an all black tail, the hell with the orange decal, and leave your front rim black, that will really mix it up. The white and black looks nice. Makes it look a little more slender than it really is. Yes, that is a Single Sided Swingarm FZR600 that I built.